Alumni, friends, and strong community and industry partnerships play essential roles in helping us shape tomorrow’s leaders and contribute to the social and economic fabric of Australia and the region. 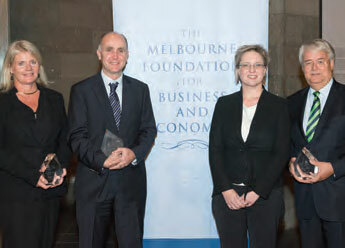 The fifth Annual Dinner of the Melbourne Foundation for Business and Economics saw a record number of influential business leaders gather in the Great Hall at the National Gallery of Victoria to celebrate the connections between the Faculty and the business community, the impact of philanthropy, and the achievements of alumni. Chair of the Foundation Mr Tony Burgess (BCom 1980) took the opportunity to raise the need for entrepreneurship in Australia. As globalisation and technology continue to transform the economy, it will be vital in the years to come to nurture a culture of business creation to sustain employment, innovation and growth for the future. "To provide the next generation of job opportunities in Australia and to underpin our continued prosperity, we need to build on our strengths to create new businesses," said Mr Burgess at the event. He announced the new Master of Entrepreneurship to be offered in partnership with Ormond College and other University faculties from 2016. To support this important addition to the business and economics curriculum, proceeds from the Foundation Dinner will be put towards advancing the growing ecosystem of innovation and entrepreneurship at the University of Melbourne, including a Chair in Entrepreneurship. "Philanthropic support increases our capacity to attract talented staff and students, and conduct programs that make vital contributions to education, knowledge and society," said Mr Burgess. Mr James Gorman, Chairman and Chief Executive Officer of Morgan Stanley, who graduated from the University of Melbourne with a Bachelor of Arts (BA) and Bachelor of Laws (LLB), delivered a keynote address focused on effective management and his journey from Melbourne schoolboy to Wall Street executive. Guests also heard from graduate student Richard Homewood (BA 2012, MIntBus 2014), who provided insights from his first taste of entrepreneurship in a small Kenyan town and from his latest startup, SafeDrive, an app that rewards drivers for not touching their mobile phones as they drive. Alumni of Distinction included Outstanding Achievement Award recipient Michael Andrew (BCom 1972 LLB 1978), Leadership Award recipient Yasmin Allen (BA Hons 1982 MA 1985), Outstanding Contribution to Faculty and University Award winner Professor Jeff Borland (BA Hons 1982 MA 1985), and Rising Star Award recipient Jeremy Burke (BCom 2003). Allen received further accolade shortly after the Foundation Dinner, being named Australia's eighth most influential nonexecutive board director in BOSS magazine.